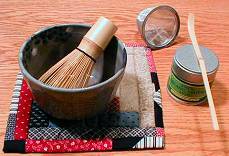 With a little planning, it's really not that difficult to make matcha! 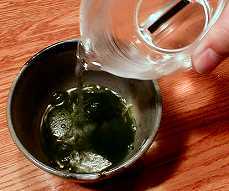 When brewing matcha, heat your matcha bowl by adding very hot water and allowing it to sit for a few minutes. Then, empty and DRY COMPLETELY. 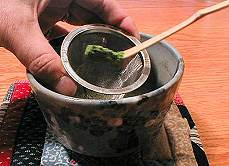 With special bamboo tea spoon, add 1 1/2 ~ 1 3/4 spoonful of thin matcha to the bowl (double for the thick koicha type). We like to sift it through a screen for a more consistent, frothier brew, but this is optional. 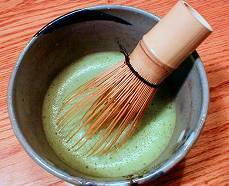 Note: If you are using a regular teaspoon instead of the traditional Japanese bamboo matcha spoon, only add about 1/4 of a teaspoon! 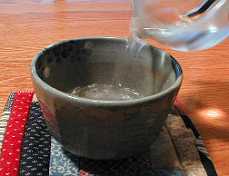 Add about 1/2 cup of hot water with a temperature of about 175F/80C. Important: This is somewhat less than boiling. Wet your tea whisk. 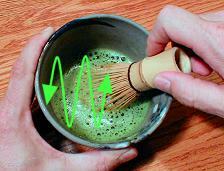 Next, whisk briskly in a "W" shaped pattern for a minute or two until the matcha froths to a nice green colored foam.